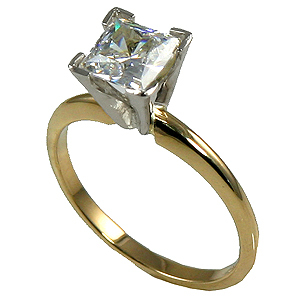 Stock #S101PV: Russian Cubic Zirconia in Solid 14K Gold Princess Cut Solitaire Ring. Unbelievable Price!! Surplus.. must liquidate... russian CZs are more precisely cut & polished of the best CZ quality available... VERY NICE STONE. (Also available in White Gold). Available in other sizes & shapes by special order. TOP SELLER!